Opening note or two: while there’s already been a themed write-up for this month on “demons” in general, I plan to discuss a far more specific and intriguing group that happens to fall under that broad overall label. Also, if anyone hasn’t played Nocturne yet, 1) Why not? And 2) Be advised, there are some minor spoilers ahead. If you’ve ever glimpsed my blog, my forum posts, or most anything else (including the opening notes to this article) that I’ve done on Destructoid since I first weaseled my way in amongst your collective ranks, it’s probably become abundantly clear to you that Atlus’s PS2 RPG Shin Megami Tensei: Nocturne is one of my all-time favorite videogames. Naturally, there are a great many things about the title that move me to sing its praises so loudly, and frequently -- even a modest attempt on my part to chronicle my collective thoughts on Nocturne would be even more of a marathon for readers to finish than this blog’s usual fare. That said, though, while it’s all but impossible for me to single out any specific aspect of this title that could truly be called its “best feature” or some such thing, this month’s theme does provides me with an opportunity to expound upon what I do believe to be, perhaps more than any other single element, what makes Nocturne such a uniquely compelling experience. Allow me to begin by briefly setting the stage. As the game opens, you, a modern-day Tokyo high school student, take a trip across town to visit one of your teachers, currently hospitalized. Along the way, passers-by are abuzz with news of a deadly riot that took place in a local park just the previous night, not to mention rumors that fringe cultists and inhuman creatures were somehow involved. Once you reach your destination, the hospital appears eerily deserted, save for a pair of your friends you’d agreed to meet. The three of you split up to find out what’s going on, and sure enough, before long you stumble across makeshift “operating rooms” decorated with pentagrams and speckled with blood. At the same time you finally encounter another person, a man, but he’s hell-bent on (if also apologetic about) killing you then and there. Before he can do so, however, your missing teacher suddenly intervenes and takes you to the roof, hastily attempting to explain what’s going on. Before you get much more than the basic idea, however, across the horizon you see the sky darken, and the entire city begins to collapse onto itself. Just like that, the world as you know it is ending. As your vision fades, you perceive the image of a young boy and a veiled old woman who bestow upon you the power to survive this calamity and the coming aftermath, in exchange for nothing more than a promise to make whatever you choose to do from here “interesting.” You eventually awaken, in the very same hospital, your skin now adorned with wild, glowing patterns of black and viridian, the body beneath them surging with an intoxicating new energy, and the blood of a Fiend burning through your veins. As you slowly begin to explore your surroundings and grasp the overall situation, you come to the realization that humanity has been all but wiped out, as only a handful of passive, disembodied souls remain of your former fellow city-dwellers. The world outside the hospital has been transformed into a sprawling, spherical desert, divided into pieces via bottomless chasms and dotted with the crumbling ruins of human civilization, as an all-powerful mass of pure, sentient energy waxes and wanes at the center. As you gaze across the dying remains of the existence you so recently took for granted, you feel many things as you attempt to make sense of it. More than anything else, though, you feel very alone. But, as you will quickly learn, you are not alone. Not even remotely. You see, after humanity was forced out, something else, someone else, moved in, and took its place. The world of man is finished. Even you yourself are not completely human anymore. You are simply one more denizen of this savage new world, and your fellow dwellers will prove to be your most ruthless predators…as well as your only hope of survival. You’re in the world of the demons, now. As in most RPGs, your first direct encounter with this world’s new dominant race will be in the form of a random battle. You’re over here, it’s over there, and during each of your turns you do your best to bring the other down. Naturally, this process will be repeated countless times between now and the rolling of the credits. You’ve seen this routine play itself out in every such game you’ve played, right? Well, yes and no. After a bit more progress and a handful more scuffles, you encounter something new. A short distance down the hospital hallway, you can see another demon -- not appearing out of thin air, spoiling for a fight, but relaxing, against a wall, in plain sight. “Is this a boss or something?” you wonder, as you slowly approach it. With some trepidation you max out your HP, close the distance and press the “confirm” button. Turns out you prematurely wasted those healing items. Indeed, despite there being a demon standing right there in front of you, there is no battle to be had. The creature, instead of springing for your throat, addresses you with a jarring, unexpected gentility. Perhaps it regards you with awe or cheeky curiosity, unusual interloper that you are. Or, in casually musing about the latest goings-on, offers you a bit of unintended insight into your intimidating new surroundings. Or simply brushes you off with a smirk, dismissing your presence as not worth interrupting its current activities for. “But wait a sec,” you might think, wasn’t I just fighting for my life against one of these things?” It’s not your imagination -- that same frightening being (or, more accurately, a fellow member of its clan) that just brought you within an inch of your life is now conversing peacefully with you. Moreover, before long you’ll find that there are many others like it. All over this new world, there are demons who can’t be bothered with constant fighting, as they’re already occupied with running various businesses, waiting impatiently to meet a tardy friend outside the mall, drinking away their depression at the Ginza lounge, and quarrelling amongst themselves (and sometimes even with former humans’ souls) regarding which emerging “Reason” (a set of conflicting philosophies dictating how the world should be remade) everyone would do best to follow. Suddenly it’s apparent that, in spite of their frequently-startling appearances, not every creature you’ll happen across in this writhing, reborn Tokyo is just one more mindless, bloodthirsty sack of experience points. After all, lest you forget, you yourself are one of them now. True, these unusual demons are just, well, NPCs when you get right down to it, but they’re some of the most interesting and well-realized “townsfolk” that you’re ever likely to encounter. They’ll do their part to make you look at this game’s “monsters”, and their world, from a very different perspective then you were expecting at the outset. Oh, and by the way, you’ll soon find out that the aforementioned, memorable as they are, are actually the least-interesting type of demon you meet. 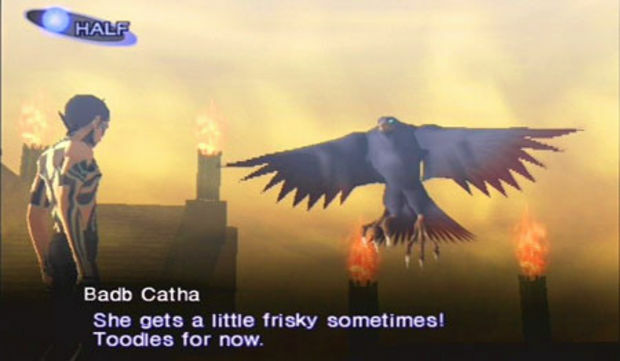 While their more peaceful counterparts do a lot to flesh out Nocturne’s world in their own way, the demons you meet in battle, roving about the landscape with their own goals in mind, are an even more intriguing bunch, and perhaps the most compelling reason you’ll have to keep playing Nocturne until the very end. At first, as in most RPGs, your skirmishes are very simple, and occur only to allow you to cut your teeth on their basic mechanics. Before you’ve progressed very far, however, you’ll come to realize that you’re not going to be able to make it beyond that point on your own. You’ll need to recruit some other demons to help you defend yourself and make your way in the world. The only time you can normally do this, however, is in the heat of battle. While getting a hearing ear from a demon you’re fighting can be a daunting proposition, it also sheds even more light on exactly what kinds of fascinating creatures you’re dealing with. For starters, to successfully recruit a new ally, you must first take into account whether or not you’re strong enough to get their attention (you’ll be brusquely accosted, to put it mildly, if your opponent is too confident in his ability to beat you down), who else is on their side in a particular battle (if you try to converse with one opponent, another might interrupt you), who in your party should be the one to speak up (your opponent, for instance, may be more likely to acquiesce to a sultry Succubus than submit to you), and which clan the demon hails from (some such groups are either too primitive to converse in your tongue, or simply too proud to give you any attention whatsoever). Once you’ve gotten those basic factors lined up favorably, you can successfully begin negotiating. And then things REALLY get interesting. The first thing you’ll notice when talking to a potential recruit is how forcefully its unique personality comes through, even in something as basic as how it responds to your initial request. Some demons will react with surprise (“What the hell?”), another might get flirty (“ … are you asking me out?”), others counter with aggression (“DO YOU EXPECT ME TO JOIN YOU?”), while still others will grandly address you with an antiquarian flair (“I cannot bear thy wild figure!”). Even demons who flatly refuse your offer will reply in their own unique manner. If they’re unable to speak, they’ll moan and yowl, and even if they regard you as an unworthy speck they may commend you for having the cojones to have approached the likes of them in the first place. Assuming that you do have a demon on your hands that’s willing to hear you out, it’s not likely to offer its help for free. It’s going to ask you for money and/or items to seal the deal. While it’s sometimes prudent to hand a demon everything it asks for without hesitation, other times not immediately giving in to all of their demands will instill a bit of respect in them and increase your odds of success. Moreover, you’re not always going to be the one initiating the conversation. Sometimes, without warning, you’ll catch the eye of one of your opponents, and he or she will try to get your attention (in manners ranging from “Hey, you! You! Yeah, you!” to “Hey there, big boy”), requesting either a spare item or an answer to a question (once again, you’ll need to keep that demon’s particular personality in mind when answering). Other times, an enemy on the threshold of defeat will beg for its life, offering either companionship or a bribe of its own in exchange. Careful, though, as it could simply be trying to trick you into giving it an opportunity to renew its attack or run away. Oh, and there are also mechanics in place which allow you to barter with demons to obtain items or get a loan, but I’ll spare you an in-depth writeup on those. After all, I think you get the idea of what you’re in for when you meet up with the demons of Nocturne. Your little brother’s Pokemon they ain’t. Moreover, once you’ve got a team of demons on your side, you’ll come to appreciate their uniqueness and innate appeal even more. And not just in terms of practical applications of their battle skills (though obviously having your sorry carcass saved by your posse time and time again does help). For starters, if you strike their fancy they may go out of their way to (sometimes grudgingly) praise your ongoing efforts after leveling up, and contribute an item they’d been hiding to the overall cause, or attempt to change or level up a skill (and make a disappointed face if you refuse to allow it). Moreover, I’ve been rather lax thus far in discussing the demons’ physical appearances, and they really do deserve a mention. Any of you out there who enjoy role-playing games but are sick of the “over-accessorized” design mentality so common within the genre these days are likely to love the aesthetic mindset behind Nocturne. 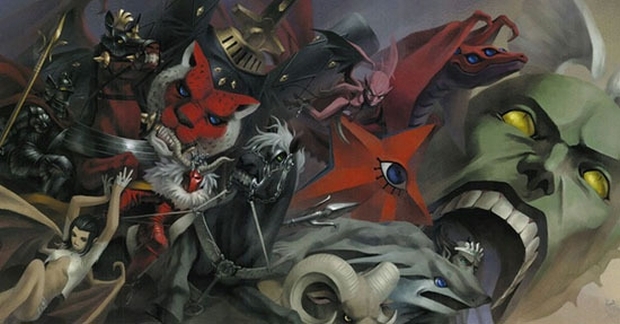 Creative director and artist Kazuma Kaneko draws inspiration for his creatures from the annals of just about any regional religion or folklore you can name (a brief explanation of each demon’s origin is available in-game for perusal alongside their stats, for the mythology buffs), and proceeds to apply his own slick, shadowy flair. While I’d be lying to suggest that there’s no overlap whatsoever between any of the game’s hundred-plus demons, there’s still a huge amount of variety on display, from the simplest and most straightforward (Will-O-Wisp, Oni) to the freakish and unnerving (Rakshasa, Mada), to the alluring (Pixie, Uzume) to the just plain badass (Thor, Beelzebub). Although there is a vast amount of creatures to see, there are few, if any, true “duds” in the bunch from a design standpoint, as nearly every single demon you encounter is just as striking and memorable from a visual standpoint as they are in terms of personality. 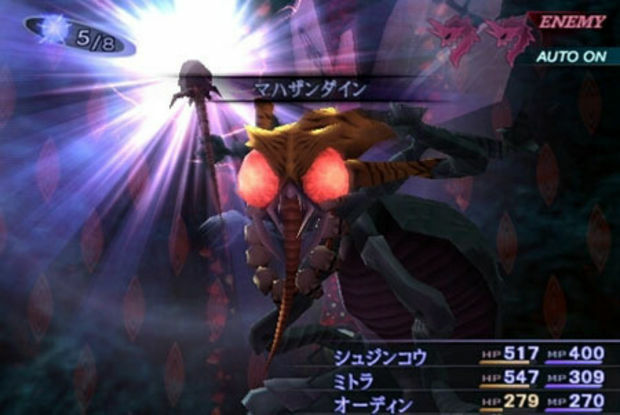 Plus, unlike many RPGs of the era, everyone has several different attack animations to display, depending on the technique being used. While Uriel might stab with his sword for one attack and simply wave his hand for another, Dionysus can either wield his staff like a baton or spread his arms wide and belt out an echoing, operatic spell command. Speaking of which, while none of the game’s dialogue is voiced, your demons still make quite a lot of noise in the middle of a fight, and it’s just as striking as their looks. Whether it’s Dakini’s raspy taunt of “Come on!”, Aciel’s throaty, lilting roar, Sudama’s series of high-pitched squeaks, Dominion’s breathy yawns or Virtue’s deep, ominous laughter, you’ll come to recognize the game’s cast as much by their “voices” as their appearances. Even when they die, these demons make their presence known. You’ll likely have the sad howl of a defeated Cerberus and the mad cackle of a dispatched Archangel echoing in your head long after the fight is over. Of course, even with such a formidable bunch at your fingertips, everyone’s going to find demons that they’re not as fond of as the rest, whether the design just doesn’t appeal to them, or (more likely) its skills in battle just aren’t suitable for the task at hand. What to do? Well, there’s always the option of outright dismissing the unwanted demon and recruiting a different one in its place, but depending on where you’re at your options are limited to whoever’s wandering around the area. Thankfully, a far more compelling solution presents itself to you. Namely, the Cathedral of Shadows, which allows you to fuse two (or, under certain circumstances, three) demons together, into a completely different (and usually more powerful) ally. While the basic idea behind fusion is simple, learning the ins and outs of it will take some experimentation. While completely filling up your Compendium is not even remotely necessary to finish the game, any new creature that you conjure up can be “registered” at the Cathedral, and thereafter directly summoned in that state at any time (for a fee). Thus, whenever you feel like taking a break from the “main” quest you can mess around with demon fusion, and see what kinds of new creatures are lurking out there in the void, waiting to be unleashed. In similar fashion, even when you’re stuck at a nasty section and find yourself needing to grind a bit (which will happen less and less as your stable of demons grows), the time passes quickly, as you’re eager to build your current crop up enough to make them ripe for optimal fusing (though again, this isn’t completely necessary), and thus find out which intriguing new allies you may be meeting next. Oh, and did I mention that, with a bit of additional experimentation, you can figure out how to fuse and acquire most of the game’s bosses too? Granted, there are a handful of adversaries that will remain out of your grasp no matter what you do, but odds are, if you ask “Will I eventually be able to get him?” after barely surviving a fight against a major enemy, the answer will quite likely be “Yes.” Accompanied, of course, by a giddy ear-to-ear grin and the gleeful rubbing together of one’s hands in anticipation. If you’ve never experienced the world of Nocturne for yourself, it can be hard to visualize everything I’ve mentioned above coming together successfully into anything resembling a cohesive whole. As such, I feel compelled to make a particular example of some of the game’s most memorable denizens -- the other Fiends (yep, you’re far from the only one). Early on, you’re forced into an encounter with one of these powerful, skeletal crusaders, the Matador, as you enter a room along your journey and find that one or your special items (a Candelabrum) is beginning to flicker on its own. As it turns out, he has one just like it, and is out to claim yours as his own, in the name of a much larger, more consequential quest. Suddenly you’re dragged underground, into the Fiend’s desolate, nightmarish realm, and challenged to battle. Before he unleashes his terrifying assault upon you and your party, however, he shows you a side of himself that you’d never expect to see. From behind his empty skeletal eye sockets and deathly grin, Matador enlightens you, matter-of-factly, regarding the nature of his purpose, and just why he has so suddenly challenged you. His mission, as it turns out, is to track down and defeat anyone else who carries a Candelabrum, with the end goal of being deemed worthy of a very high honor by his master (whom you’ve also met, though you didn’t know it at the time). Thus, while he openly regrets that there is no one present to observe your battle, he encourages you to fight as hard as you possibly can, to ensure beyond doubt that the strongest and noblest among the two of you emerges the uncontested victor, and can thus continue the search for the other Candelabra and their bearers. If you do manage to defeat this ferocious adversary, you will likely soon find yourself being hunted by his counterparts, all seeking the same thing as he … and possibly, now yourself as well. While each of the Fiends is a very different sort of opponent (Daisoujou will utter chilling screams to drain your energy, Red Rider will simply physically overpower you, Trumpeter will use the overall condition of the combatants at large to his advantage if you let him), all of them, to the last, are chillingly, earnestly cordial when you encounter them, greeting you as one of their own and insisting that you honor them with your best effort. Moreover, if you choose to meet their challenges head-on, rather than avoid them when possible, as you send more of them to their demise their remnants will praise and urge you on even more insistently, hoping out loud that you become the one to pass the trial and claim as your own what each of them has so ruthlessly sought. You will quickly learn to fear the sight of your Candelabrum suddenly burning brightly, but at the same time you can’t help but be excited to meet another new, brutally challenging, and yet unmistakably gallant adversary, who holds the next key in the death-dealing journey you’ve taken up as your own. And even after these terrifying adversaries have fallen, they still have one more surprise in store for you. If, while continuing the quest you inherited from them, you stumble upon a particular sort of item, you can bring these most worthy opponents back from the dead and, though your jaw may drop when you first see it (as mine did), onto your own team. I can assure you, few videogame experiences are more empowering -- or fulfilling -- than finally fighting as one, alongside your fellow Fiends. And that’s just one notable example of Nocturne’s uncanny bond between player and rival that comes to mind. I assure you, there are many others. Some criticize Nocturne as an RPG for “skimping on the story,” and “being little more than a glorified dungeon crawl”. In the end, at a glance, there may seem to be merit to these claims, as there are very few “characters” (in the sense in which that word is usually applied) to interact with. And indeed, the vast majority of your time playing the game will be spent fighting for your life amidst your fellow demons, instead of passively watching events unfold or scrolling through text. Those who immediately conclude that these factors “rob the game of its personality,” however, are quite simply missing the forest for the trees. Even if there are no cute, sweet childhood friends to declare their (obvious) love for you halfway through, or effeminate super-villains to drown you in grandiose (and frequently empty) monologues, you’ve got an incredibly varied and captivating cast of personalities to interact with -- throughout the entire game, constantly all around you. Moreover, it’s quite difficult to attempt to shoehorn most (perhaps all) of them into any particular RPG archetype. They, like you, have their own thoughts and feelings about the world, and these may change as time goes on. One minute you may be fighting for a certain cause, and the next have happened upon something that moves (or forces) you to change your mind. The same goes for them, and you’ll see it happen, on scales large and small, before your very eyes. Those who dismiss the demonic inhabitants of Nocturne as “just one more set of enemies to fight” must either have never actually experienced the game or else simply do not know how to experience games in the first place. These impeccably-realized personalities are not your average roaming band of assorted drooling creepy-crawlies -- they are a world and an experience unto themselves. Even the wording of this month’s theme does not entirely do them justice. “Enemies”, or even “antagonists”, is far too limiting a label to bestow upon their storied ranks. If I were in a position to demand it, I’d insist that the demons of Nocturne be universally known as, not one of the most memorable sets of “bad guys” in gaming, but one of the greatest supporting casts in the history of the medium. On second thought, maybe even the “supporting” label does these fascinating demons a disservice. They, after all, are why I’m writing. They are why you’re playing, or should be.